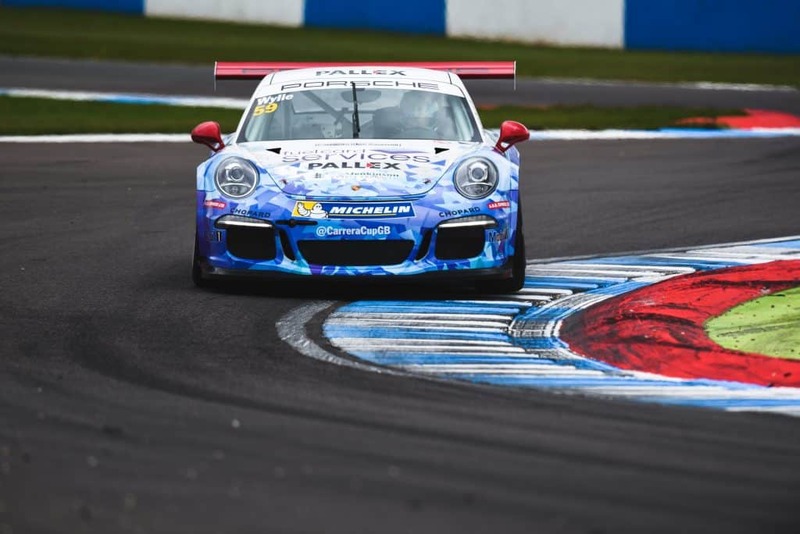 The 2017 Porsche Carrera Cup moved to Leicestershire for rounds three and four of the championship as the Slidesports team took on Donington Park. See race photo gallery, here. The team, and pro driver Ross Wylie in particular, had previous testing experience at the 1.9-mile circuit, having taken part in the official test session before the start of the season. The track time helped and was topped up with both drivers completing a good number of laps in Friday’s two free practice sessions. As Saturday came around the team were well prepared for the official qualifying session and made the most of it. Ross improved on his pace in the opening weekend of the championship and easily qualified in the top ten, taking a brace of eighth place grid spots. David Fairbrother meanwhile had even stronger form, lining up in second on the ProAm2 grid for both races. The stunning Fuel Card Services/Pall-Ex branded Porsches assembled on the grid for race one and the team were in optimistic mood for a good result. Ross got a great start and was mixing it with the established drivers for the opening laps before his speed dropped off and it was clear he had an issue. Meanwhile David was making progress, holding his own in second place in ProAm2 behind 2016 class runner up Peter Kyle-Henney. After thirty minutes of close racing David crossed the line to finish second and claim his, and the team’s, first Carrera Cup class podium finish. Ross was able to finish the race in 11th place, a problem with his suspension identified as the cause of his slowing pace. The second race of the weekend was to be a longer 40-minute event however a paper work problem saw the two cars forced to start from the pit lane. For this race only the rules dictated that all cars must start on new Michelin tyres but the team did not have any available so the cars had to wait for the grid to clear the line before joining the race. It was a hard lesson for the team to learn but Ross was able to enjoy racing through the pack to finish 14th overall from dead last, with David finishing fourth in ProAm2.